I'm Curious Too: How Would You Sound Like On Venus? 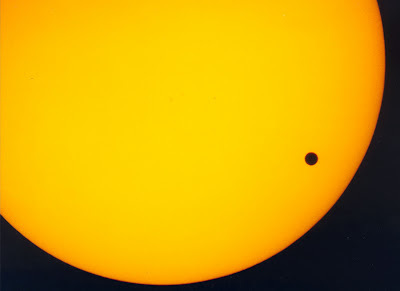 In conjunction with the Transit of Venus this week, I think I should write something about Venus. Venus is the second planet from the Sun, and it's the hottest planet in our solar system. 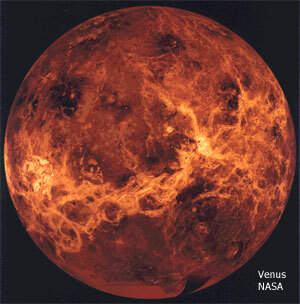 The surface temperature on Venus can reach 482 degree Celsius, high enough to melt lead and even zinc. But how would we sound like on Venus? Tim Leighton, a professor of acoustics at University of Southampton thinks that we would sound like a Smurf, with a deep bass voice. On Venus. The reason for the drastic transformation is the same reason that makes Venus the hottest planet in our solar system. Venus's atmosphere is much denser than ours, and it traps the heat from the sun within the planet, causing severe warming effect. The dense atmosphere enables sound to travel faster, but restricts the vibration of vocal cords, yielding a lower voice. The effect is opposite of what happens when you inhale helium. But it's never possible to put this to test--Venus's atmosphere contains clouds made of sulfuric acid, 96.5% carbon dioxide and 3.5% nitrogen. Plus, I can't think of a reason for anyone to pay Venus a visit. No, you won't find a living soul on Venus, much less a woman.